Turing orange into gold, lets cold smoke some cheese! 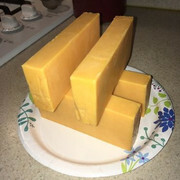 4 - 8oz blocks of you favorite cheese. 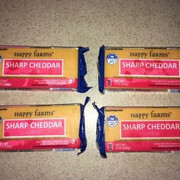 I'm using Wisconsin sharp from Aldi's at $1.69 per block (Guzzi content, cheap, but not in quality just price) unwrapped and set on counter for 30 minutes or so to come up to room temp. While the cheese is comming up to temp set up cold smoker. I use a MES 30 with the mailbox mod. The mail box mod keeps the heat away from the smoker and also allows time for creasote to drop out of the smoke. So by the time the smoke hits the chees its "clean" and just leaves a nice smoke flavor. If you've ever tried home smoked cheese that was harsh and bitter it was cresasote. 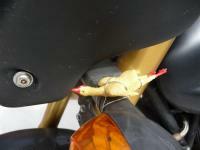 For lighting I use my HF heat gun that I got for abotu $6.00 (Again more Guzzi content, cheap). It works really well at lighting the pellets and also charcoal. I prefer it to wax blocks, or lighter fluids as I get no off taste from and electric element. Once the pellets ignite let the flame burn for a minute or two then blow out. 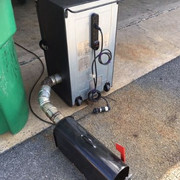 Now place the smoldering pellet tray int eh mail box, close the door and raise the flag so everyone in the neighborhood will know you are working hard. 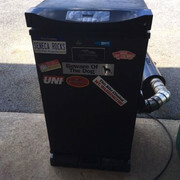 Also open the vent on the smoker full open. When smoking more is not better. You do not want billowing amounts of smoke coming out of the vent. 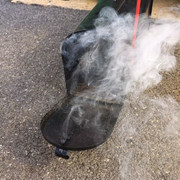 You want a barely vislble wisp of thin blue smoke trickling out of the smoker vent. Let the chees smoke for 3 hours over you favorite wood. I prefer apple as it is nice and mild and compliments cheeses very well. Cols smoking is considered smoking at any temperature under 100 degrees F. This means you don't even have to power on the smoker. Honestly you can cold smoke in a cardboard box. 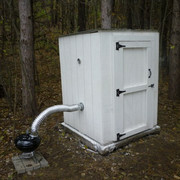 All the enclosure does when cold smoking is keep the smoke in and washing up over the product. After 3 hours remove the cheese from the smoker. You can sample now and if you did everything right the cheese will be edable and tasty. It will however benefit even more if you let it on a rack in the fridge overnight to gas off then next day vac pac and lest rest in the refridgerator for 2 to 100 weeks to let the smoke really penetrate the meat and let the flavors meld. If the cheese is bitter right off the smoker all is not lost. Do the fridge rest then vac pack and in a few weeks the bitterness will mellow and you'll have a good ediable cheese. The longer it rests (to a point) the more mellow and beter it gets. So what this mean is try smoking a few blocks and if it comes out then smoke a whole and put it up for later use. Once vac pack put in a bottom drawer of the fridge and it'll keep for a really long time (years). So as each month passes you can pull out a block and compare it the blocks that were not matured as long to see how the flavors develope. This is how you make a $1.69 block of cheese taste like a $10.00 store bought block of cheese. Gouda comes out exceptionall well. If it a little sour or bitter all is not lost. Re: Turing orange into gold, lets cold smoke some cheese! Terrific! Great Guzzi content. Got into it last year myself. Here's the one I built. Did two hogs and about 20# of cheese in it. Only need to add the cresent moon on the front door to disguise it as an outhouse. raise the flag so everyone in the neighborhood will know you are working hard. 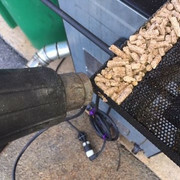 Wood chips won't work in the amazing pellet tray. You can use pellets or saw dust. After years of dealing with chips buying a grinder to make my own chips I have abandon them. They don't turn long enough and a throw lots of moisture a creosote. 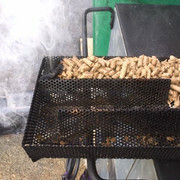 My pellet tray will give good quality smoke for 12 hours using 1/2 pound of pellets. To get the the same smoke time using chips I'd use several pounds and I'd have to tend the chip hopper mutiple times. When smoking bacon I do 8 to 10 twelve (12) hours sessions. Using chips I'd use 20 or 30 pounds verses 6 pounds of pellets. For bacon thats $20 or $30 in chips or $6 in pellets. Oh that is interesting...thank s I didn't know that. Creasote is a carcinogen whether eaten or on your skin. I heard that if males eat smoked cheese off of pressure treated toothpicks they are 8 times more likely to get ovarian cancer.